1000W dual stage DC-AC converter, suitable for use in battery powered uninterruptible power supplies (UPS) or photovoltaic (PV) standalone systems. 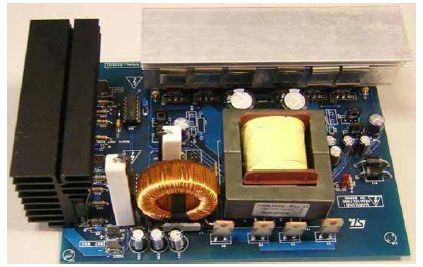 The converter is fed by a low DC input voltage varying from 20 V to 28 V and is capable of supplying up to 1 kW output power on a single-phase AC load. 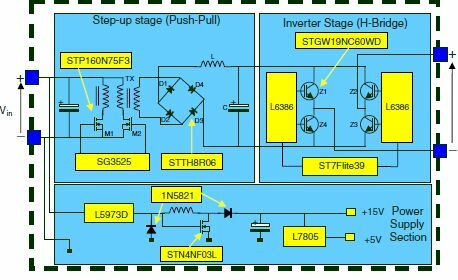 These features are possible thanks to a dual stage conversion topology including an efficient step-up push-pull DC-DC converter, to produce a regulated high-voltage DC bus and a sinusoidal H-Bridge PWM inverter to generate a 50 Hz, 230 Vrms output sine wave.